Nick here, VP of Product at Thinkific! It’s my job to make sure the voices of our users are heard, and that we’re building a product that makes growing your business through online courses not only easy, but enjoyable. Enjoy your peek behind the magic curtain of how things are done here at Thinkific, and keep those feature suggestions coming! If you’ve been using software for a while, you’ve no doubt experienced the thrill of seeing a new feature that launched and made your life waaaaay easier than it used to be. On the flip side of that, you’ve likely also experienced the anguish of dealing with functionality that never gets improved, even though you’ve asked for changes what seems like a thousand times. Well, you can rest assured that every feature request you make is heard and appreciated by our team, and after reading this behind-the-scenes look at our workflow, you’ll have a better understanding of what our team does to turn those requests into high-quality features for all of our users to enjoy. Typically, all of our features go through a 5 step process before getting into your hands. These steps are here to make sure we’re understanding the needs of our users, picking the most impactful initiatives, planning everything with attention to detail, building our vision, and then sharing that vision with all of you. The first step for us is always to try to understand exactly how we can make the lives of our course creators and their students as easy, efficient and enjoyable as possible. To help us accomplish that, we are constantly gathering feedback and ideas in many forms. Our biggest source of inspiration is always our customers themselves. Each week, we document and categorize the hundreds of feature requests and points of feedback we receive from our community of course creators. This direct customer feedback is invaluable in figuring out what needs to be improved, and how we can help people accomplish their goals with our tools. Another major source of new ideas is the tech world in general. With so many amazing companies out there, both inside and outside of our industry, we can see how other smart teams are solving complex problems and delighting their users. These sparks of inspiration then often grow into unique solutions that help make the lives of our users even easier. Finally, we also have a great love for data and analytics that helps to drive our product direction. By analyzing how people currently use Thinkific from a numerical perspective (like which pages are visited most often, and which settings are never used), we can see a whole new level of depth into the experience of course creators. We constantly use data to determine if we’re doing a good job, and where to focus next. After we gather ideas for new features, our next step is to decide what to work on, and in what order. Prioritization of a software feature backlog is part art, part science, and probably the part that can be most confusing to people who aren’t privy to the behind the scenes decision making on a day to day basis. At a high level, though, our philosophy is simple: work on features that make the biggest impact, to the most users. Long before we decide on the specifics of exactly which feature is up next, however, we need to define a more holistic vision for where we want the product to go. We combine our company DNA (what we think is important and defines us) with customer and market feedback to steer the quarterly and annual goals for the platform. We tend to focus less on specific features, and more on overarching problems we’d like to solve. We call these “themes”. For example, instead of thinking I want to add feature X, Y or Z, we’ll think in terms of solving a major problem. Something like “Make it easier to design beautiful websites”, would be the type of theme we’d start with. Once we have a major theme in mind, we can get a little deeper into specifics of what features to work on. As with any problem, there may be many solutions. By doing a rough estimate of effort and impact of each feature idea within a theme, we can quickly surface the ideas that will provide the best bang for the buck. Typically, we try to have a balance of 3 types of features within a theme: delight, performance, and basic needs. By combining those 3 aspects with the impact and effort estimations of features within a given theme, it starts to become pretty obvious what we should be working on next to maximize the benefits to our customers. 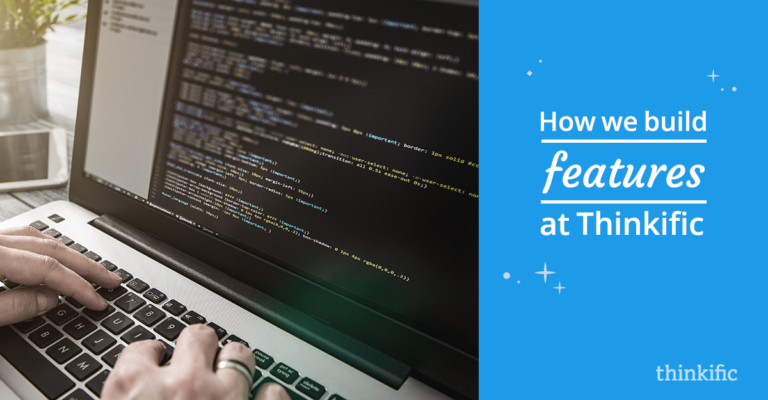 Ok, so now that we’ve decided on the major theme to tackle, and narrowed down our list of specific features that will help us accomplish our quarterly and annual goals, it should be a matter of just writing the code and making it happen right? Well, not quite yet. First, we need to create a detailed specification (spec) document for the team to follow as they implement the cool new functionality and get it ready for launch. The spec starts with a rough idea of what we’d like the new feature to be able to do and is refined and built on by multiple people until there is a clear picture of exactly how a new feature will operate and look. This involves further research into our user’s needs and how other people are solving similar problems until we think we have a solution that we want to try out. From there, our design team creates visual mockups of how the feature will look to our users. We typically then test this mocked up design with real users and our staff to iron out any problems and make sure things are clear. After a few rounds of that testing and tweaking, when we’re confident our end result will achieve the desired effect, we’re left with a document that we can hand off which clearly defines what to create. With the detailed spec doc complete, it’s time to build and implement the new feature. When we launch new features, we always have quality in mind so that our customers get the best experience possible. This means we put the new features through a rigorous review and testing process of multiple stages, allowing us to confidently launch a feature with the functionality we can be proud of. At the same time, our Customer Success and Marketing team are working hard on articles, videos, emails, and more, so that when the feature is released, you’ll know all about it and how to make the most of it. With most of the hard work behind us, we finally get to put the new feature into the hands of our eager users. That being said, launches can sometimes be complicated and time-consuming in their own right. In general, most of the launches that happen will fly under most people’s radars. We regularly deploy new features and fixes, sometimes multiple times per day. We try to launch small updates and iterate on them quickly to deliver the best experience we can offer as soon as it’s available. For larger and more complex features, however, we take a more focused approach. Depending on the feature, we may use one of a number of launch strategies including releasing features to small groups of Beta Testers only for early feedback to make sure we’re on the right track, or allowing our customers to decide if they’d like to use a new version so we don’t interrupt their current workflow. Once the launch is complete, and the news has been spread far and wide, we still aren’t done. We’ll typically keep an eye on the usage of a feature to make sure we designed a solution that works and to uncover any issues we find as more and more people begin to interact with it. All this info is then fed back into our backlog, circling back to step 1 (Idea Gathering), as we start the process all over again! If you’ve got some great ideas on how we might be able to take our product to the next level, we’d certainly love to hear your thoughts. Our team reviews all the requests individually, so I can assure you your voice is being heard. To request a new feature, get in touch with our team here. If you’re looking to play a more hands-on role in making things better for course creators everywhere, we’re always looking for awesome people to join our fast-growing team here at Thinkific. If you want to be a part of the team, check out our list of job postings here! 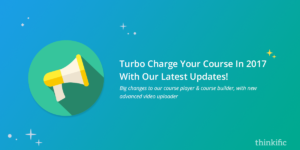 Turbo Charge Your Course In 2017 With Our Latest Updates! Previous Article Turbo Charge Your Course In 2017 With Our Latest Updates! awesome! what software do you use for Prioritisation? and for the boards in the definition and implementation steps? Hi David, thanks for the question. Right now, we are using Prodpad (https://www.prodpad.com/) for the idea ranking, and Asana (https://asana.com/) for the other steps. They’re both easy to use and make it simple to keep everyone on the same page.